The height of luxury entertainment – literally! 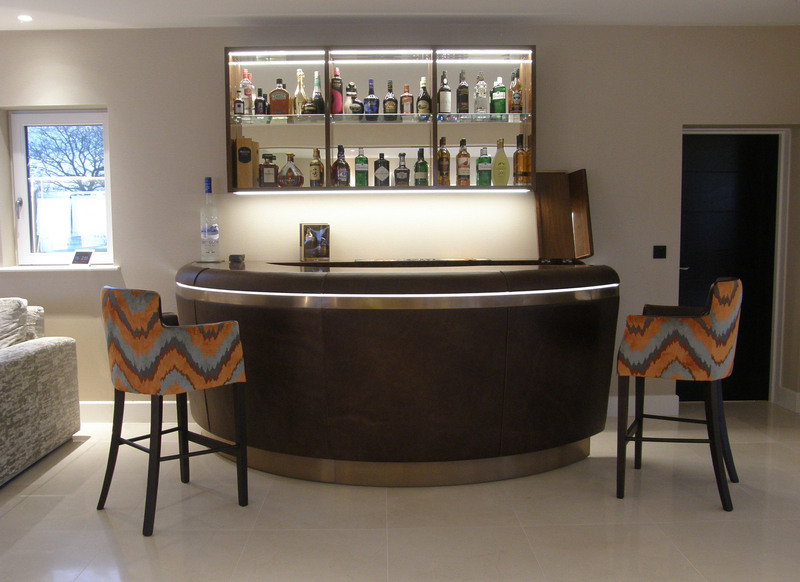 Our client had recently been travelling on business to the far east and really appreciated the Airbus A380 business class in-flight bar, so much so that he decided that he would like one in his own home. William Garvey were asked to design this curved, leather wrapped, bronzed stripped bar to be the height of luxury entertainment, if not at 40,000 feet, then certainly at sea level. The semi circular walnut counter topped kitchen bar is nearly 3 metres long with a bar flap and back cabinet end panels all leather wrapped. The veneered flap matches the countertop which is hinged on Tectus hinges in a matt nickel finish. Underneath the bar top is a full sized bar sink and fridge with a worktop counter. With LED lights and bronze strip below the rail and to the kicker this bar really does make you feel like you’re flying high!